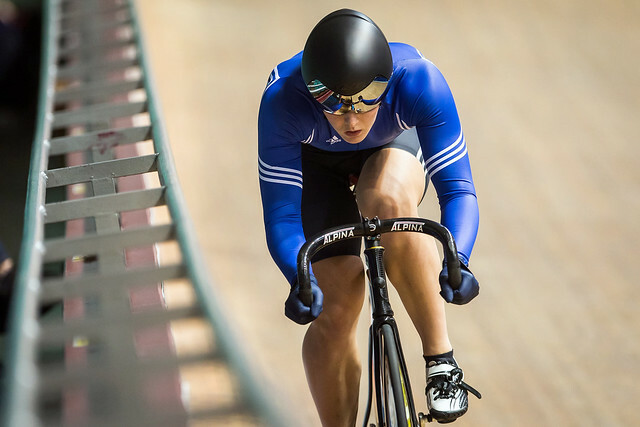 Katy Marchant excelled to win the sprint and claim her first ever national jersey at the British Cycling National Track Championships on Friday. The former heptathlete affirmed 2015 as her breakthrough year with a superb victory at the National Cycling Centre, defeating defending champion Jess Varnish on her way to the title. Becky James showed that her form was returning after an injury-hit 2014 by taking silver after losing 2-0 in the final to Marchant. Victoria Williamson claimed bronze ahead of Eleanor Richardson. “It's pretty cool! It’s my first one so I'm pretty happy to come away with a gold medal in the sprint,” Marchant said. “It's another step forward towards the world championships in London and then Rio, it's exciting. “I felt good, I was really happy with qualifying and my legs were on my side and I felt really strong and I felt like I did myself justice. Matrix-Fitness’ Laura Trott collected the women’s individual pursuit title but only after an enthralling final against 2014 champion Katie Archibald. The Pearl Izumi Sports International rider had qualified fastest and looked on course to defend her title in the final before Trott turned the contest on its head in the final five laps. The double Olympic champion triumphed in 3:32.759 to Archibald’s 3:33.065. Archibald’s teammates Ciara Horne and Joanna Rowsell Shand faced off for bronze, with Welshwoman Horne winning in 3:37.262. “I'm really happy. For me, the IP is sort of a mixed event, I didn't really know how well I was going to go. I was really happy with my time and to take the national title,” Trott said. Team Wiggins rider Andy Tennant successfully defended his men’s individual pursuit after seeing off a spirited challenge from 100%ME’s Germain Burton. Tennant was in arrears at one stage in the final but showed his experience to turn the deficit around and finish in 4.23.583 with young Burton in 4.27.209. It was a Team Wiggins double as Jon Dibben added bronze against Matt Gibson. “It's fantastic, there was more pressure this year as the reigning champion, pressure that I'd put on myself more than anything,” Tennant said. Matt Crampton timed his attack perfectly in the men’s keirin final to take the British title convincingly ahead of Lewis Oliva and Thomas Rotherham in silver and bronze respectively. Crampton surged around the final corner past Oliva with Jason Kenny boxed in. “It means a lot,” Crampton said. “It's really nice, I've had a tough year, a tough couple of years so it's really nice to step up today and put a bit of icing on top of the cake. Kadeena Cox won the para-cycling C1-5 time trial with a stunning effort in her first ever British championships. Cox set a time of 40.591 over 500m, 1:00.534 when factored, enough to win by over seven seconds. Carnac-Planet X’s Lauren Booth, defending champion, took second with a factored time of 1:07.602 seconds. Para-T’s Rik Waddon was third in 1:10.193. “It feels so good, I'm just over the moon to have won it,” Cox said. World champions Helen Scott and Sophie Thornhill clinched the para-cycling tandem kilo time trial. Pilot Scott and stoker Thornhill, who won two world titles in Apeldoorn, completed the four laps with a factored time of 1:08.709. Neil Fachie and Pete Mitchell, who also collected two rainbow jerseys earlier this year, were second in 1:02.631. Laura Cluxton and Lyndsey Carson were third in 1:07.710. “It means the world, it really does,” Thornhill said.